Humans need three basic things to remain healthy and strong: a balanced diet, plenty of clean water, and sufficient sleep. For most people in industrialized nations, these first two needs are met without hesitation; the third, however, presents a major challenge to some. According to the Centers for Disease Control and Prevention, up to 70 million American adults do not get enough sleep each night. Insufficient sleep can cause a wide variety of problems, from an increased risk for hypertension to vehicular collisions from falling asleep at the wheel. If you suffer from insomnia, restless leg syndrome, or even anxiety, getting a good night’s rest can feel impossible. Many individuals turn to prescription drugs like Restoril and Ambien to treat their sleep disorder. While these two drugs treat similar conditions, there are a few key differences that anyone taking them should know about. By understanding more about these medications, you and your doctor will have an easier time deciding which is best for you. Restoril is the brand name for the drug temazepam. It was first developed in the 1960s and attained widespread popularity in the US after it hit the market in 1981. Though the sleeping pill market has boomed in the three decades since Restoril’s debut, it remains a very popular medication among people with insomnia and other sleep disorders. Some reports rank the drug as the fifth most prescribed benzodiazepine in the US. Restoril is a benzodiazepine, which means the drug affects a person’s central nervous system. Specifically, Restoril affects gamma-aminobutyric acid (GABA) levels in the body. GABA is a neurotransmitter designed to calm the brain and nervous system. When Restoril binds to the brain’s GABA receptors, it enhances these effects, creating a sedative state. Like any prescription drug, Restoril comes with the potential for side effects. Individuals taking Restoril should watch for adverse effects and inform their doctor if they notice them. All these side effects can be exacerbated when Restoril is abused. In addition, the side effects of Restoril abuse can even continue after the individual puts down the bottle. According to a 2014 report in the European Journal of Clinical Pharmacology, cognitive impairment can persist for up to six months after long-term Restoril use – even after the individual has gone through withdrawal. If an individual uses Restoril longer than suggested by their doctor, they may develop a tolerance for the drug. They will need to take a higher dose (or take the drug in combination with another depressant, such as alcohol) to produce the same effects. This can lead to a potential overdose, which can be lead to seizures, coma, or even death. The Drug Enforcement Administration (DEA) classifies Restoril as a Schedule IV substance. This means that the DEA considers the drug acceptable for medical use with a very low risk for dependency or addiction. However, studies over the past several years have proven that Restoril does, in fact, have a rather high addiction potential. Some individuals find that they quickly develop a tolerance for Restoril once they begin using it. The Global Information Network about Drugs (GINAD) suggests that people only take Restoril for 2-4 weeks to avoid becoming dependent on the drug. If you, or someone you love, have been using Restoril for an extended period of time or taking too much, it is important to consult with a doctor or addiction specialist to wean off the drug. Never attempt to abruptly stop taking any benzodiazepine. Ambien is the brand name for a drug called zolpidem. A latecomer to the world of sleep disorder medication, Ambien became available as a prescription sleep aid in the 1990s. The drug has been hugely successful in the decades since. The New York Daily News even reported in 2016 that up to 9 million Americans used a prescription sleeping pill like Ambien regularly. 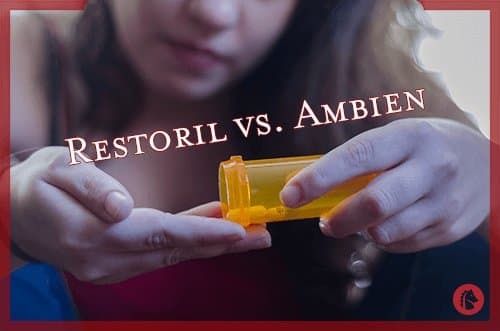 Unlike Restoril, Ambien is a nonbenzodiazepine. More specifically, it is part of a separate class of GABA-receptor agonists called imidazopyridines. But despite the differences in their chemical structures, Restoril and Ambien function in the same way – by binding to GABA receptors in the brain and enhancing the effects of the neurotransmitter. The result is a relaxed, calmed state that helps people with insomnia fall asleep and stay asleep. Ambien use also comes with its share of potential side effects. While many of them are relatively harmless like headaches and dry mouth, others can be quite dangerous. For example, some people have reported sleepwalking or even sleep-driving after using Ambien. Though this is a rare side effect, it is important that you watch for this behavior if someone you know is taking this drug. Some of Ambien’s side effects last even after the drug has worn off. A study in the New England Journal of Medicine found that individuals with a blood concentration 50 ng of Ambien per milliliter showed significant impairment while driving. This blood concentration was evident in 15 percent of women and 3 percent of men eight hours after taking the drug, indicating that Ambien can affect your ability to drive even after a full night’s sleep. Ambien has a short lifespan (it only stays in your system for 2-3 hours), so overdosing on the drug is not particularly common. However, if an individual develops a tolerance for the drug, they may increase their dosage to feel the desired effects. This can lead to a variety of health risks, including shallow breathing, slowed heart rate, and potentially death. In fact, according to a study in the British Medical Journal, receiving a prescription for hypnotic drugs like Ambien increased a person’s risk of death more than threefold. Ambien’s addictive potential has been hotly debated in the scientific community. At first, it was believed that Ambien was not habit-forming. However, the evidence against this belief has been growing in recent years. A 2007 study in the British Journal of Clinical Pharmacology revealed that Ambien use can lead to “pharmacodependence” – in other words, a physical dependence on the drug. Just like other addictive drugs, quitting Ambien does involve a period of withdrawal. People in recovery for Ambien abuse tend to experience both psychological and physical symptoms. As with a benzodiazepine like Restoril, it’s recommended to consult with a doctor before stopping Ambien use. Recovering from addiction is always possible, whether a person has been abusing Ambien or Restoril. If you, or someone you care about, exhibit signs of addiction to a prescription sleep aid, do not hesitate to reach out for help.